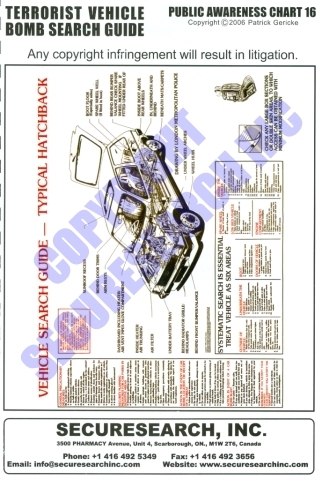 This poster is a combined cutaway view of a typical vehicle, showing all the places explosives and IEDs may be hidden, and a thorough checklist to be used by search personnel. It is an oversized poster to accommodate all of the essential text, and is an excellent guide for a security team manager to use in preparing a training program. This poster is also an aide-memoire for search teams to review on a regular basis, at vehicle checkpoints. It complements our other posters on Vehicle-Borne Improvised Explosive Devices (VBIEDs) and Under-Car bomb investigation, shown elsewhere in our POSTERS Section.